This 14 lb. 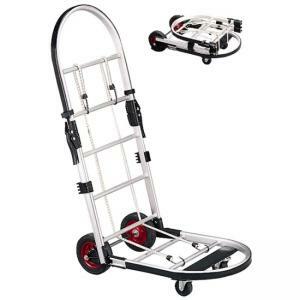 steel platform cart folds flat for easy storage. Base is 19" deep and can hold up to 200 lb. Keep large loads steady with heavy-duty steel construction, rubber wheels in back and strong 2-1/2" casters in front. Platform cart includes two elastic tie-down cords.